I know, it’s been a while, hasn’t it? We have spent the past few weeks trying to get as much done in our new house as we can before we moved over the weekend. There is still a lot of unpacking and finishing the bathroom to do. Not to mention moving the last of our belongings out of our loft and garage in the old house. But hey, check it out, this great sewalong is coming up! Is that MY name down there on the guest posts list? Eek! I tell you what, you carry on reading all the details, and I will go and clear a path to my sewing machine and start sewing some shorts! 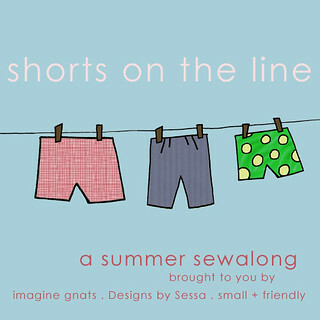 This July, imagine gnats, Designs by Sessa, and small + friendly will be hosting “shorts on the line”, a summer sewalong. For the first three weeks in July, we’ll be sharing guest posts with shorts inspiration, tutorials, and pattern reviews. those sewing along at home will have a chance to be featured in our sewalong round-up posts the last week of July…. and some *great* prizes, including fabric, patterns, and gift certificates! Check out the guest judge line-up and keep an eye out for the announcement of the sponsors and prizes, coming soon. Until then, get ready by joining the shorts on a line flickr group and check out our shorts on the line pinterest board for some short-y inspiration. I am so excited about this! Thanks so much, ladies, for taking the time to put it all together!